"Bagpipes Cryin'" by country Duo Rushlow Harris. The song is based on a poem written by Commander Mark Waddell, as a tribute to the SEALS he lost under his command. It's a moving tribute to those who sacrificed so much for us. Via saul anuzis, at RedState. Please take the time today to remember all those that sacrificed so that we are able to live in freedom. Observe the National Moment of Remembrance at 3 p.m., local time, today. Pause for a minute in an act of national unity to honor those who died for our freedom. Ask others to remember, to observe the Moment wherever you are. Or do as Ralph Kinney Bennett suggests in his phenomenal "Go and find a soldier's grave." Go and find a soldier's grave and think about what it means; what it really means to give your life, in its prime, for your country. Make this Memorial Day truly memorable. 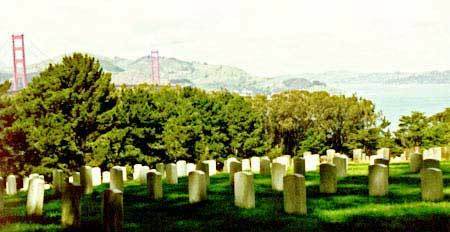 The image above is from the National Cemetery in the Presidio in San Francisco. 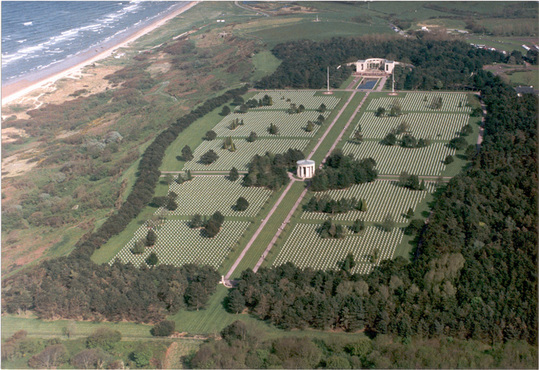 The image to the left is an arial view of the World War II Normandy American Cemetery and Memorial, which is situated on a cliff overlooking Omaha Beach and the English Channel in Colleville-sur Mer, France. Edwards, the self-proclaimed multimillionaire champion of the middle class who lives in a humongous mansion and requires his campaign pay for his $400 haircuts as well as spa treatments, leads a crass attempt to "politicize" Memorial Day. The Democratic presidential wannabee, who stars in the popular YouTube video "I feel Pretty," and who four years ago earned the nickname "Breck girl," asks his supporters to use the holiday to denounce the war. "Revolting is a kind word for it. 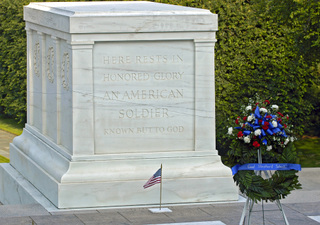 It's as inappropriate as a political bumper sticker on an Arlington headstone," Morin wrote on the Legion's Web site. "Edwards is hardly the first politician from either political party to exploit this day, a holiday that was consecrated with the blood of American heroes. But the e-mail makes me sick nonetheless." "It's not about picnics or trips to the beach. It's not about making pro- or anti-war statements. It's not about supporting political candidates," Morin wrote. Get vocal. Buy a bunch of poster-board and markers. At a picnic or with family and friends, make signs that say “SUPPORT THE TROOPS - END THE WAR.” Bring them to your local Memorial Day parade. Then take a digital photo of yourself and your family or friends holding up the poster and tell us about it. We’ll include it in a “Democracy Photo Album” on our site. Edwards' attempt to seek a personal political advantage by dishonoring the sacrifice of our heros is a sad departure from the way Memorial Day is usually celebrated in this country. 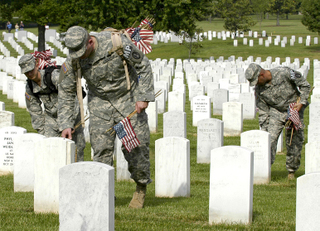 U.S. Army soldiers of the 3rd U.S. Infantry, The Old Guard, place American flags in front of grave markers during the "Flags In" ceremony in Arlington National Cemetery, Arlington, Va., May 25, 2006. Photos courtesy of the Defense Dept. by William D. Moss. A flag waves in front of the Tomb of the Unknowns also known as the Tomb of the Unknown Soldier for the "Flag's In" ceremony at Arlington National Cemetery, Arlington, Va. May 25, 2006. 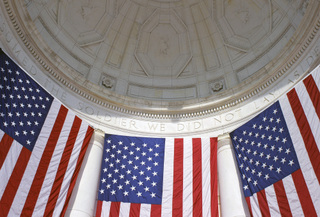 The wall of the Memorial Amphitheater at Arlington National Cemetery reads "When we assumed the soldier, we did not lay aside the citizen." These words of President George Washington are remembered for the "Flag's In" ceremony at Arlington National Cemetery, Arlington, Va., May 25, 2006.